This is not an episode! This is Claire and Dearbhla having a chat about the pattern for Episode 1. As mentioned in Episode 1, we plan on releasing a pattern with each episode. Each pattern will be free until the next pattern is released. At the end of the year we will publish an ebook collection of all the patterns released during the year. The pattern being release with Episode 1 is called “Muireann” and we hope you enjoy the pattern and enjoy the chat. There is no requirement to register as you are well below the VAT threshold of €37,500 of turnover per year. 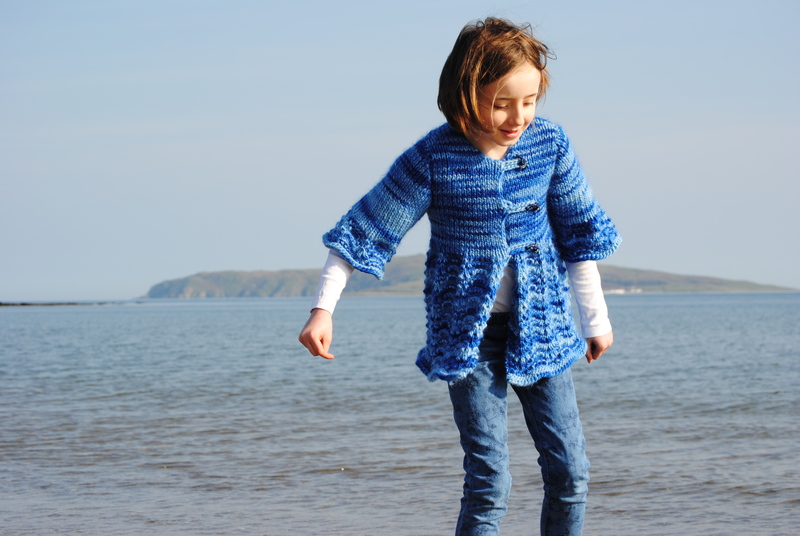 Muireann is a top-down girls’ cardigan with ribbed bodice and feather-and-fan lace swing that started with the buttons! My daughter fell in love with beautiful ceramic buttons in the shape of dolphins. Blue-variegated yarn was quickly purchased and a sea-themed jacket was promised. The girls’ name Muireann (pronounced Mwih-RhaN) is derived from the Irish words for “muir” which means ‘sea’; and “fionn” meaning ‘white’ or ‘fair’. True to its name, the combination of the color-changes and the shaping of this jacket re-create a “fair sea” for the dolphins. 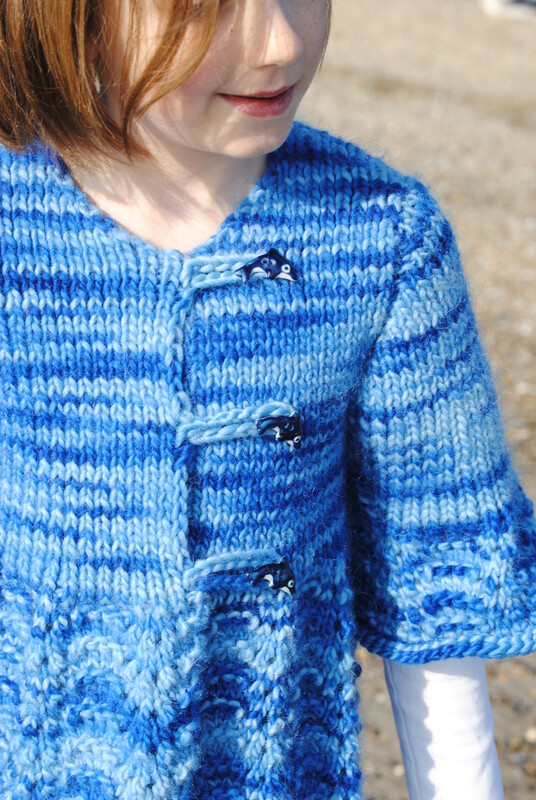 The colour-changes of the yarn on the bodice are like the play of sunlight on a deep, blue sea. When the structured ribbing reaches the empire line the change of gauge to ridged feather stitch allows the fabric to flare. The ridged feather stitch pattern is textured enough to allow the variegations of the yarn to shine. 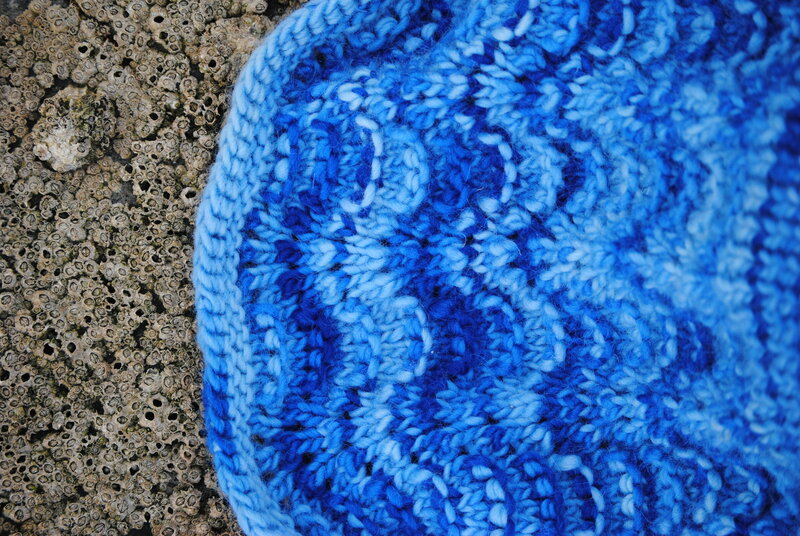 As a bonus, the waves formed by the stitch pattern are like the waves breaking on our local beach. After a provisional cast-on, the back is worked until it is one-sixth of the armhole circumference. Then each front is worked from the cast-on stitches to the same length as the back. Stitches are picked up for the sleeves and the fronts, back and sleeve-caps are worked simultaneously, with paired increases forming the sleeves. Just before the sleeves are divided away from the body, stitches are added to the body and the sleeves for the underarm shaping. It started with the buttons! I’ve laid out the pages with the photographs grouped so that the pattern falls over the central four pages – to minimise printing. I hope you enjoy spending time with Muireann!